As of 1/28/2019, the ice is reported at 17 to 20 inches on most areas of the lake with 6 to 10 inches of snow on top, the wind can cause the snow to drift in areas. Fishing for trout has been very good the bite has definitely moved to an early morning bite, before and as the sun is coming up. Trout are being caught in many different areas, some fish are being caught in all different water depths, the fish deeper seem to be suspended about 15 feet below the ice. Many different baits have been successful in catching fish. Large tube jigs on the bottom have been working along with spoons for the more aggressive fish. Kokanee Salmon are also being reported as good, look to the deeper waters to find schools of salmon suspended 15 to 35 feet below the ice. Heavier spoons have been working well, such as Kastmasters or Swedish Pimples. Northern Pike fishing is still sporadic but is expected to pick up closer to the late ice season as the fish will move into the shallows for the spawn. As of 2/7/2019, ice at the reservoir has been reported between 14 inches or more. Fishing remains good for trout in the 16 to 19 inch range. There have also been reports of some much larger fish being caught. White and pink tube jigs tipped with waxworms or mealworms seems to be working well. Keep an eye on approaching storm fronts to change the barometric pressure and increase success. Fishing seems to pick up with the recent storm fronts that have been rolling through causing a change in the barometric pressure. As of 2/5/2019, ice in the marina cove ranged from 5 to 6 inches. Ice on the main body of the reservoir ice is thinner around 3 inches. Fishing is good for trout using spoons or small jigs tipped with waxworms. Anglers have also reported success during the low light hours catching walleye in the deeper portions of the marina area. Reports of Yellow Perch and Crappie have been few and far between. As of 1/29/2019, about 30% of Jackson Lake is open water. Winds and warm weather have caused the ice to deteriorate on most of the northern portions of the lake. The west shore contains thin ice or open water. The ice along the south shore and dam is about 4-8 inches. Fishermen are reporting success with jigs and meal worms. Walleye, Crappie and some smaller Wipers are being caught near the pump house. Please use caution on the ice and always carry safety equipment such as a PFD, whistle, ice picks, and a spud bar. This 762-acre impoundment is located off of E. Quincy Avenue, two miles east of E-470. As of 2/1/2019, current ice conditions range from 0 to 6 inches with the thickest ice in the back of coves. Open water access for shore fishing varies day to day. Open water exists throughout the main body of the reservoir. Please keep in mind that these conditions can change quickly this time of year and caution is advised. Trout fishing success varies from slow to good using mealworms and jigs. Perch action is sporadic with some good reports occasionally, otherwise perch fishing has been slow. February park hours: 6:30am to 6:30pm. For more information call 303-326-8425. This 1,356 impoundment is located in Chatfield State Park. As of 2/6/2019, the majority of the lake was iced over with ice ranging from 3 to 10 inches. The ice on the south end of the reservoir is more solid and consistent compared to ice on the north end. As always caution is advised any time you are venturing out onto the ice. The fishing has been sporadic with some anglers catching decent numbers of trout on spoons tipped with waxworms or mealworms. Some really nice size trout are being caught. Anglers have been reporting some success catching walleye on the structure near deep water throughout the lake. Smallmouth Bass have still been caught along the rip rap rock using spoons or jigs. As of 2/7/2019, 22 to 24 inches of ice with 3 to 6 inches of snow cover with drifting near the edges. The water clarity is great, and you can see all the way to the bottom! The fishing is starting to really pick up again after the tournament in early January. There is still a large range of fish being caught with most fish between 14 and 19 inches. Lures that have been producing waxworms, mealworms, and small jigs with plastic tails tipped with a waxworm, and gold spoons. As of 2/7/2019, North Delaney: 24 to 26 inches of ice with 3 to 6 inches of snow cover with drifting near the edges. Fishing feedback seems to be slow. South Delaney: 22 to 24 inches of ice with 3 to 6 inches of snow cover with drifting near the edges. Feedback on fishing is that south is more active than North Delaney but has definitely slowed since the Delaney's Tournament. 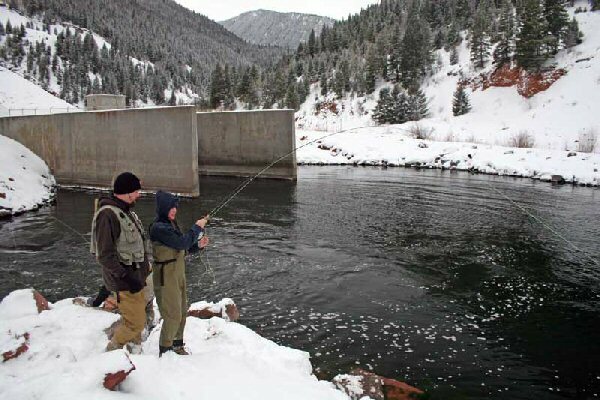 As of 2/3/2019, currently anglers are reporting catching rainbows in the 16 to 18-inch range on waxworms, mealworms, and ice jigs. The lake has approximately 16 to 20 inches of ice, however, please always use caution when accessing the ice for fishing. The south road is closed for the season. We have approximately 3 feet of snow on the ground. The Visitor Center is open 7 days a week from 8:00 a.m. to 4:00 p.m.
As of 1/25/2019, the reservoir recently froze over with 10 to 12 inches of ice being reported with a thick blanket of snow over the top. Always use caution when fishing on the ice and be sure to fish with a buddy. Ice conditions can vary greatly across the lake so it is important not to let your guard down. Fishing has been good for pike and trout being caught throughout the lake. As of 1/28/2019, there have been reports of small crappie and some northern pike being caught near the North East Access Cove. Anglers are reporting success on small tube jigs and spoons for crappie and larger silver spoons for pike. Call the Park Office for updates on ice thickness at 970-276-2061. As of 1/28/2019, the reservoir currently has 6 to 8 inches of ice with about 10 inches of snow cover on top of the ice. Ice thickness can vary across the reservoir so extreme caution is advised. Reports are that perch of various sizes are being caught in the slightly deeper portions of the reservoir. There have also been sporadic reports of trout and pike being caught. As of 2/2/2019, the entire lake has capped with varying ice conditions from 6 inches to 18 inches thick. Really good reports of trout are coming in and a few lake trout have been caught through the ice in Iola Basin as well as Elk Creek. Anglers are catching trout off of chartreuse colored jigs tipped with mealworms and gold minnow baits at about 10-15 feet of water. Anglers are starting to report some better salmon action in various areas of the lake. Now that ice has formed in the deeper areas of the lake, look to start using tube jigs in the white, pumpkin seed or even green colors to fish for the lake trout. Check in with a local tackle shop to get the latest ice conditions as they will change daily. As of 1/27/2019, ice is about 10 to 14 inches thick with 4 to 5 inches of snow on top of the ice, but as water is rising in the reservoir, it is breaking away from the edges and it can sometimes be 5 feet from shore. Early morning is not usually a problem, but getting off the ice later in the day can be tricky. Please use the buddy system, wear a life jacket and drill test holes along the way. Fishing reports are coming in of anglers catching catfish, perch, crappie, pike, and bass. Anglers are reporting the most success using smaller tungsten jigs with wax worms or meal worms. As of 2/1/2019, the lake is capped with layered ice, anglers are reporting a layer of 3 inches of ice followed by about 4 inches of slush and finally 10 to 12 inches of hard ice. Snow is beginning to make the walk down to the lake from the paved road very difficult unless you are on a snowmobile. Fishing for smaller lake trout has been fair using darker colored tube jigs as close to the bottom as you can jig them. Some trout have been caught suspended off the bottom. Look to the east part of the reservoir for pike fishing as there are some large pike present in this reservoir that will slide up shallow as spring approaches. As of 2/5/2019, the lake level is 6015.22 feet and the water temperature at the boat ramp in Arboles is approximately 40 degrees Fahrenheit. There have been no recent reports from fisherman as to how the fishing has been. The boat ramp at Two Rivers Marina is expected to re-open on March 1st.